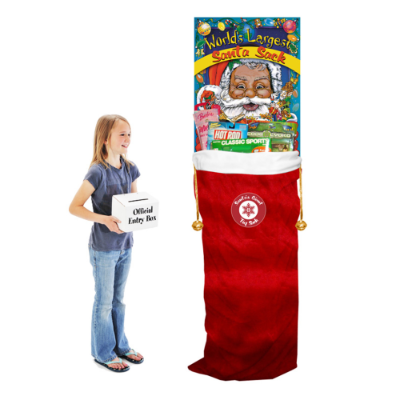 The Nation’s Oldest and Most Trusted Source for Giant Toy-Filled Christmas Stockings and Year-Round Holiday Promotions! Spring is just around the corner, so it’s time to order your giant Easter promotions! Join the thousands of savvy businesses and individuals who order our giant promotions as their proven retail traffic generators, raffle prizes, charity donations — or even personal gifts to loved ones. The tremendous value and impact our seasonal promotions brings every summer is so great that we have a re-order rate of over 80%! 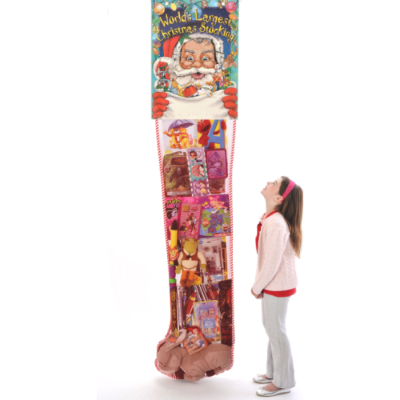 Our Giant Christmas Stockings with Toys and other giant seasonal gifts are perfect for businesses in many different industries, including banks, restaurants, car dealerships, supermarkets and more! This is because each festive display always draws positive attention and increases foot traffic year after year. 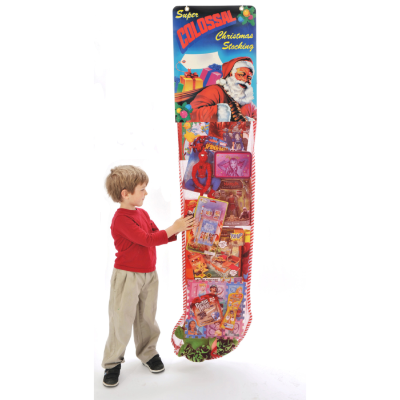 The seasonal promotions we offer including our 6-foot and 8-foot filled Christmas stockings and Easter promotions come in a wide variety of styles and colors, and are stuffed full with popular toys from name-brand manufacturers including Hasbro, Disney, Mattel, Nickelodeon, Marvel Comics and more. Toys are carefully selected to appeal to both boys and girls between four to 10 years of age, but the displays attract folks of all ages. Reward loyal customers with raffle entry tickets. 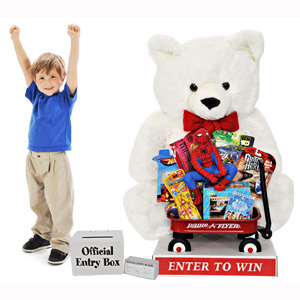 Use the display and raffle to draw attention to any specific area of your store. Raffle off the stocking as a fundraiser for your organization. Use the display as a dealer loader to energize your partners and associates. Set up the display to attract people walking past your storefront. Join the thousands of other retailers and individuals who celebrate the season with our giant Bears, Bunnies and toy-filled Christmas stockings. No matter which display you choose, it’s sure to brighten your holiday season. Our customers have a re-order rate of over 80%, and your complete satisfaction is our number one priority. Start (or continue) a wonderful holiday tradition with these always-loved promotional displays! "I have received positive feedback from our dealerships on their events. They indicated that the promotion increased their test drives by 30% and sales between 18-20%!" "I have been buying the Giant Stockings for years for my rent-to-own stores. All the stockings come with everything needed to run an in-store contest, making an easy to administer promotion for all of my store managers. It’s efficient, clean and successful at all levels"